Due to its complexity, the evolution of cities is something that is difficult to predict and planning new developments for cities is therefore a difficult task. This complexity can be identified on two levels: on a micro level, it emerges from the multiple relations between the many components and actors in cities, whereas on a macro level it stems from the geographical, social and economic relations between cities. However, many of these relations can be measured. The design of plans for cities can only be improved if designers are able to address measurements of some of the relationships between the components of cities during the design process. These measurements are called urban indicators. By calculating such measurements, designers can grasp the meaning of the changes being proposed, not just as simple alternative layouts, but also in terms of the changes in indicators adding a qualitative perception. This thesis presents a method and a set of tools to generate alternative solutions for an urban context. 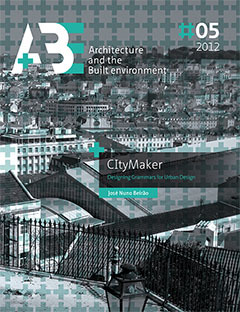 The method proposes the use of a combined set of design patterns encoding typical design moves used by urban designers. The combination of patterns generates different layouts which can be adjusted by manipulating several parameters in relation to updated urban indicators. The patterns were developed from observation of typical urban design procedures, first encoded as discursive grammars and later translated into parametric design patterns. The CItyMaker method and tools allows the designer to compose a design solution from a set of programmatic premises and fine-tune it by pulling parameters whilst checking the changes in urban indicators. These tools improve the designer’s awareness of the consequences of their design moves. BEIRÃO, José. CItyMaker. Designing Grammars for Urban Design. A+BE | Architecture and the Built Environment, [S.l. ], n. 5, p. 1-440, nov. 2017. ISSN 2214-7233. Available at: <https://journals.open.tudelft.nl/index.php/abe/article/view/beirao>. Date accessed: 24 apr. 2019. doi: https://doi.org/10.7480/abe.2012.5.44.